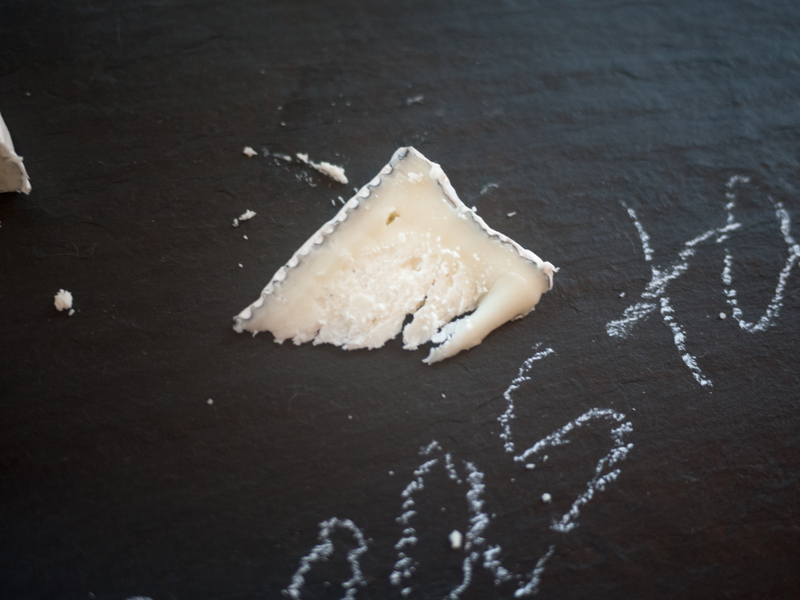 I’m Audra in Seattle, and yes, (wait for it) I am indeed “cheesed to meet you,” and “cheesed” to be a part of this multi-national celebration of cheese. I’d like to explore some Pacific Northwest cheese as part of this project, as a way of learning more about my adopted home. For my first post, I chose Seastack from Mt Townsend Creamery. 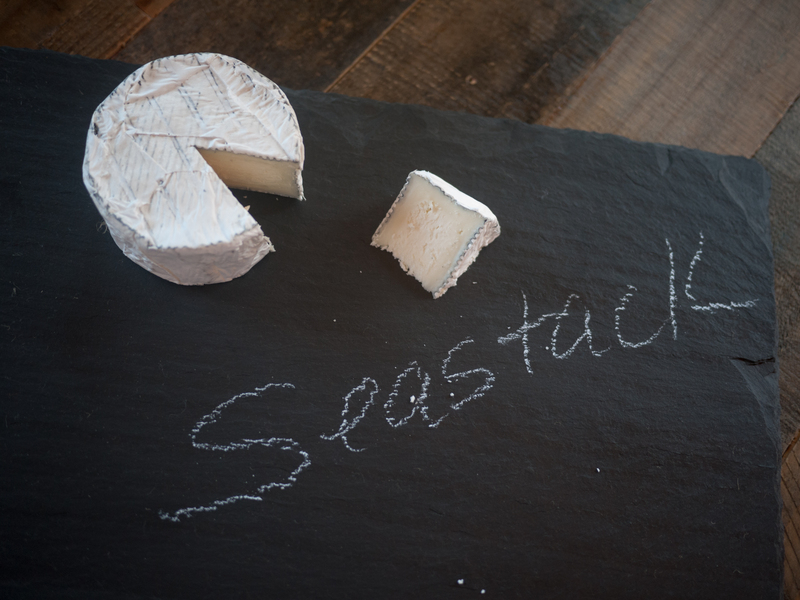 Seastack is a young cheese that purportedly changes dramatically within a small amount of time- as far as cheeses go. It’s a “bloomy rind” cheese in the Camembert tradition and has a thin layer of vegetable ash surrounding it to lengthen the ripening period. As a bloomy rind cheese, it ripens from the outside; you can see the cheese strata (no strata pun intended) in the photo of the cheese wedge below. A creamier, more homogeneous outer layer transitions to a crumbly-looking interior. I’d never given much thought to the inner life of cheese before having to write about Seastack. It’s one of the pleasures about writing about things that it makes you think about things too. As I was falling asleep the other night, I had a half-asleep idea that a bloomy rind cheese could be a metaphor for the human condition in many ways. Our raw inner selves surrounded by strata of emotional and psychological and social layers. But how does it taste? To be honest, I’m not a bloomy rind cheese kind of gal. I think this style takes me back to my study abroad summer in France when I was nineteen; for me, bloomy rind cheese tastes irredeemably of my own youthful arrogance and consequent embarrassment, and the early 90’s. But I tried to be attentive and to appreciate it on its own terms. And contrast in food always excites me: I found I most enjoyed this earthy, alkaline cheese when paired with the contrasting sweet acidity of apples (but I’m sure pear would be wonderful too.) I would love to experiment with eating Seastack at different stages during the ripening process, but I don’t think my cheese budget allows for it at present. There is no doubt that Seastack is delicious. It’s cheese, people. In summation, don’t let my youthful shenanigans in the Loire Valley tinge your opinion of this layered and fascinating cheese. Annoint some pear and apple wedges with Seastack, and you will not be disappointed!